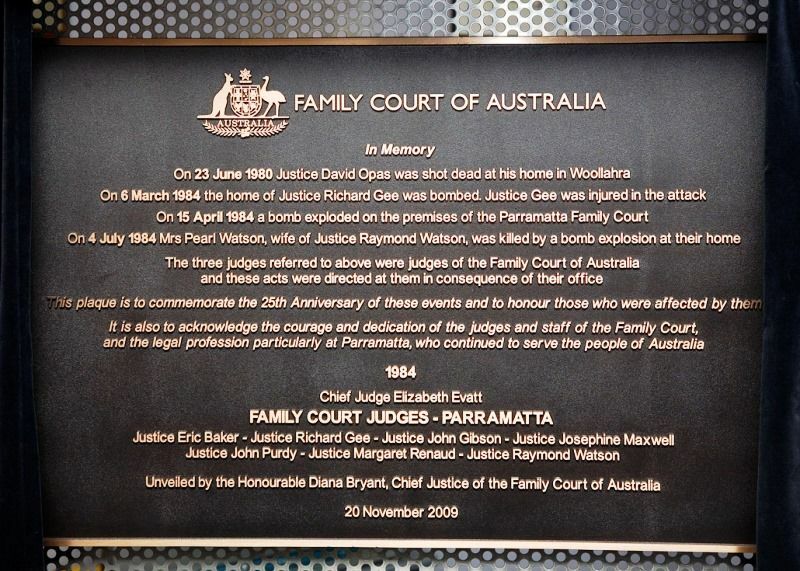 A plaque commemorates 25 years since the series of bombing attacks on the Family Court at Parramatta and the homes of some of the judges of the registry. The plaque honours those who lost their lives and those affected by the the events. The plaque also acknowledges the courage and dedication of the judges and staff of the Family Court, and the legal profession particularly at Parramatta, who continued to serve the people of Australia, notwithstanding the real risk to their safety and that of their families. The 1980s was a tumultuous decade for the Family Court. Judges, their families and staff were targeted in a series of separate attacks which effectively changed the lives of all those involved and resulted in two deaths. On 4 July 1984 Mrs Pearl Watson, wife of Justice Raymond Watson, was killed by a bomb explosion at their home. It is also to acknowledge the courage and dedication of the judges and staff of the Family Court, and the legal profession particularly at Parramatta, who continued to serve the people of Australia.